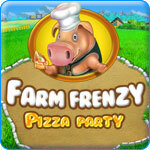 Farm Frenzy Pizza Party Game - Download and Play Free Version! Cultivate a Booming Farm and Eat some Pizza while You're at it in Farm Frenzy: Pizza Party! Get Ready For More Frenzied Farming! With the newest in this entertaining series, Farm Frenzy - Pizza Party! 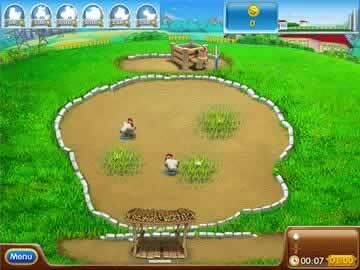 continues the fun farming action as you try to meet the various goals for each day's labor. Experience more of the cute graphics, challenging tasks, and smooth gameplay the series is known for. Take advantage of new products and processing buildings to create even more valuable commodities and upgrade your farm into a manufacturing powerhouse. Enjoy the all new pizza concept and use cheese, dough, and a variety of ingredients to complete pizza recipes from around the world. 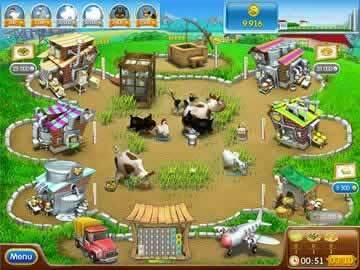 For those unfamiliar with the series, Farm Frenzy involves some sound time management that has you taking care of livestock, such as chicken, goats, and cows, to get their output, like milk or eggs. You then send theses different outputs to your small farm buildings to process them into other items, such as egg powder or cream. Finally, you combine these with certain city items you purchase, through a plane, to form complex items like dough. Your goals change for each level, for instance in one you might only have to get so many chickens and collect a certain amount of eggs while another might have you creating dough and getting 550 dollars worth of money. To earn the extra cash to upgrade your farm buildings or buy more animals, you can send the complex items you produce into town on your truck and reap the rewards. While all of this is occurring, your farm will be occasionally attacked by bears which you have to trap in cages by clicking on them multiple times. Farm Frenzy - Pizza Party! provides an intriguing gaming experience that is fun for all ages. The use of a tracking timer, which awards gold medals if you complete a level rather quickly, still allows you to complete a mission even if don't finish in time to get any medals. This is a much better learning environment in comparison to other games which cut you off if you don't meet the goal. Figure out your own strategy as you work your way through the levels and figure out the various recipes. You'll have to take full advantage of the various upgrades, which you can purchase at the store, if you have any hope of getting even a silver medal with the mid to late levels. So if you are a fan of the series or just like solid farming-themed time management games, download Farm Frenzy - Pizza Party! and hit the fields today! Watch some clips highlighting the trophy room, some possible farming upgrades, and the management styled gameplay found in Farm Frenzy Pizza Party.